Black Water Hose holder are made of quality materials, making hose hanger durable enough to withstand the heavy weight of water hose. This water hose holder can also resist rusts and is portable. 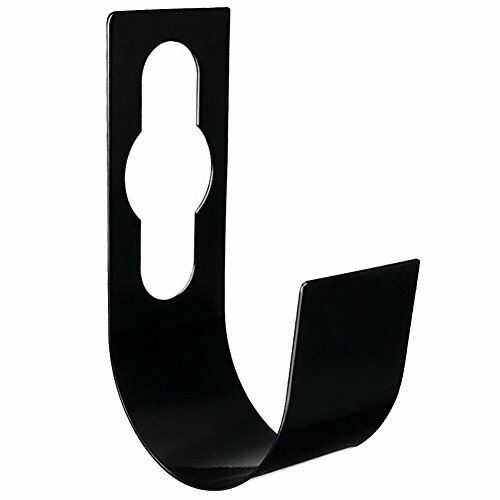 Hose hanger of this kind is specifically designed to fit in your preferences and taste. Water Hose hanger, hose rack, and hose reel hold your hose well and prevent from any unwanted kinking, tangling, or twisting. With this kind of hose holder black ,keeping hose on its top condition becomes an easy task. It can also work as faucet mount hose holder. Hose hanger allows ease of use. Kochee hose hangout, pocket hose holder, and decorative hose holder do not require intricate assemble procedures and overwhelming instructions. hose rack come in wide ranging sophisticated design. Quality Material and Big Size - Water Hose holder are made of high Quality Metal, 8.5 inch *4 inch*3 inch Size making hose hanger durable enough to support 25FT/50FT/75FT/100FT expanding metal garden hose holder hanger Outdoor. Perfect Design - Designed to hold the garden hose / expandable hose / flexible hose / expanding hose, In such a way that ensures no Kinks, Twist or Tangles. The hose holder can also resist rusts and is portable. Easy to Fit - Hang from faucet, very easy to use and very easy to instal..You can adjust any direction depending on the circumstance. What You Can Get - 1pcs * Garden Hose Holder (HOSE IS NOT INCLUDED) and Notice that This Hanger only work well for Expandable Garden Hose. If you have any questions about this product by HECOPRO, contact us by completing and submitting the form below. If you are looking for a specif part number, please include it with your message.